I heard yesterday (but was too busy getting ready to go out and celebrate my 40th birthday to mention it) that I've got a gig helping write the back story to a new magazine, Tales from the Transdimensional Horror Express. It's an illustrated, quarterly, dual language (English-German) horror fiction publication with nostalgic style and content - somewhere between a 1930’s weird fiction pulp and a Victorian periodical. The back story is an ongoing story, not unlike a TV soap, that will involve all of the regulars onboard the Trans-Horror Express. It will unfold through comments, hints and observations made by each passenger whilst introducing a featured story or article. I'm excited about this as I feel it will stretch me as a writer. I read what I thought was a useful bit of advice somewhere the other day, which basically said don't mention story rejections on blogs or websites as you never know who's reading. In effect, any prospective publisher or agent who's interested in your work could find the posts with a simple search, and where they once wanted to publish/accept the work, they see it's been rejected x amount of times and change their mind. Although the above agent's comment inspired me, not long after that I ceased writing for a number of years due to work commitments. But that manuscript with the crap title - Gimokodan is the underworld of the Bagobo people of the Philippines - still gnaws away at me to rewrite it. One day I will. As with most things, too many projects, too little time. I've just returned from visiting my brother in the Lake District, and on the way home the family and I called in at Morecambe 'holiday' resort. Now I've visited many such resorts in the past, and as a kid I loved them, but I've noticed that lately, most of them are abysmal. In this instance, the attractions hunched empty and unused on the sea front. A few forlorn chip shops, gaudily painted signs and boarded up buildings are now what constitute a holiday destination on the west coast. It's no wonder bookings at such resorts are down - I wouldn't fancy spending a week in one, that's for sure. The worst resorts seem to be in the North of the country, as down south and around Cornwall, the towns and villages seem to be maintained - perhaps it's a money thing, something to do with the north/south divide. Even the small funfair in this resort was terrible, with half the attractions looking liable to collapse. The people strolling around looked like zombies, and the people running the ‘attractions’ didn't look old enough to be out of school. This particular resort once had Frontierland Western Theme Park - now closed and abandoned, which I took a couple of photographs of, mainly because it inspired me. I know there have been numerous books on abandoned funfairs before, but the same could easily be said of vampires (which up until yet I have not penned a tale of), so it's another story on the back burner. It's a shame such places are left to rot; now the only cries are when someone cuts themselves on the glass that litters the floor after they've broken in to smooch around. What was once a popular holiday destination is now the fodder of a horror writer. I've sorted out a deal with the publisher of my novel, and if people order Evilution via the Invisible College Press web site, and type the word SALE into the coupon code, they'll get $5.00 off their order. Also postage within the US and Canada is free (to all other countries it's £2.99 - $5.00). So people can purchase a copy for only $9.95. A team of neuro-scientists on the Caribbean island of St Kitts have created primates with partially human brains. They injected human brain cells into monkey foetuses, giving them up to eight million human brain cells each. 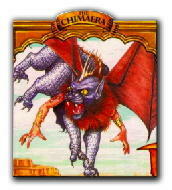 The modified monkeys have been called 'chimeras', which in Greek literature are mythical monsters combined of lion, goat and snake. The reported reason for this experiment is to assist with medical research into neurological illnesses, but this never sits comfortably with me. By altering the genetic makeup of a species, scientists are playing at God. This case puts me in mind of the film, Planet of the Apes. They [scientists] say that incorporating eight million human brain cells into a primate is not that significant as the brain has 20 to 40 billion cells, so is unlikely to do anything to change the characteristics of that brain. I'm not convinced. Anything that alters a species, no matter how small, must have an impact. What would be the result if one of these animals escaped and bred? And then there's the ethical issue of these experiments. It ultimately poses the question, when man becomes the creator, what use have we for gods? To whom should the faithful bow down? Some people say that science is the new religion; perhaps they are closer to the truth than they realise. I work on the railways here in the UK, but I'm based about 150 miles away from London. After todays horrific events, we are on amber alert at the moment, so having to be extra vigilant. I've been 'out in the field' all day at a specific hotspot in our area, making sure the trains being rerouted and diverted from London can run without delay. It's frightening stuff, and another case of the reality being worse than the fiction when it's real life. I've just had a reprint acceptance (The Flibbertigibbet) for an as yet untitled subscribers anthology at SpecFicWorld, which will be a free download when it appears. Although this venue doesn't pay, the previous anthologies they published had over 30,000 downloads, which is a lot of potential readers. The editor accepted the story within 1 day. I always liked The Flibbertigibbet, and it was previously published in Hellbound Book's anthology, Deathgrip: Legacy of Terror, which is now out of print, so it'll be good to let a wider audience have the opportunity to read the story. Dark Discoveries magazine is now at the printers, so it shouldn't be long before it's available with my story, The Watchers. I notice from the many venues I visit that it's award time again. I do vote for work that I liked, and there are numerous awards being presented around this time, and not to detract from any winners’ success, but I do question the value of certain awards. The main problem (as I see it) is that they (awards) depend on people reading said work and then voting for it if they like it enough. So if writer 'A' has published a story/book etc in an obscure little 'zine with a low readership, and writer 'B' has published a story in a 'zine with a large readership, then it's statistically more likely writer 'B' will have more people vote for his story (assuming both stories are of equal calibre). That's not to say writer 'A' had written a worse story, just that not many people read it. I know if I was ever lucky enough to win an award, I would appreciate it, but I do feel the awards process in many instances is flawed, and I wonder if there could be a fairer system of voting. When I look down the lists of final recommendations for an award, I know that I will only vote for those that I read and enjoyed, but it doesn't mean it was the best. And this is the problem. Without reading everything on the list, how do I really know that story 'A' was not as good as story 'B'? I suppose the only way around this is an unbiased panel of readers whose job it is to read through everything submitted, but I imagine this would be a time consuming and expensive way of doing things. Although it works for some film festivals, such as Cannes, where I believe (although I may be wrong) films are submitted for consideration and then voted on by a panel in a secret ballot. The Booker Prize (and perhaps others) works along similar lines: UK publishers may enter up to two full-length novels for a specific year. In addition, any title by an author who has won the Booker Prize and any title by an author who has been shortlisted in the last ten years may be submitted. Publishers may also submit a list of up to five further titles for the judges' consideration. The judges are required to call in no less than eight and no more than twelve of these titles. One thing that distinguishes the Man Booker Prize from other literary awards is that the judges read all of the submitted books. The list of submitted titles is strictly confidential. Oh well, perhaps I shouldn't think so much. Congratulations to those who have won, and to those who are yet to win any award, no matter how it comes to be.